The monastery was included in the World Heritage List in 1993. 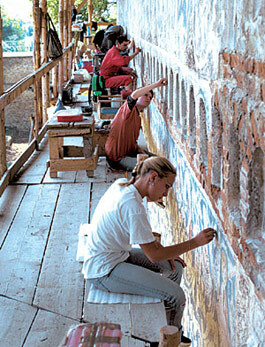 The church and its mural paintings, as well as the whole monastic compound, were restored by UNESCO in collaboration with the Romanian Government between 1996 and 2000. Summary: The exterior paintings of the Church of St. Nicholas are faded, but the interior ones are among the finest of their kind in Moldavia. The remains of the monastic buildings were found in archaeological excavations. The commemorative inscriptions both on the church wall and on the gate tower mention the year 1530. 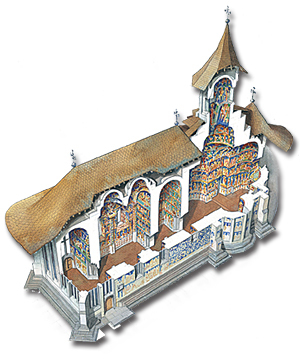 It is usually considered that the church was completed in 1530 and painted in 1532. The recent excavations in the monastic compound suggest, however, that the other constructions were finished several years later. 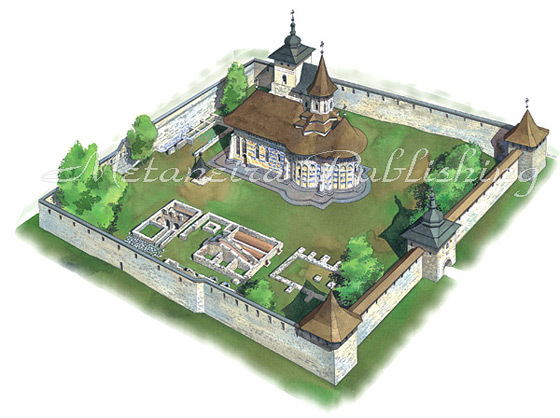 The other monastic buildings were built between the years 1530 and 1550, and the surrounding walls in 1550. On the outer façade of the gate tower, there are the remains of frescoes with eight figures, most probably Petru Rareş, his family and two archangels. In the middle is a niche with a painted figure of St. Nicholas, the patron saint of the church. Below the saint is a beautifully carved coat of arms of Moldavia, with an inscription which says: “This monastery was built by Prince Petru in 7038 (1530) and was surrounded (by a wall) after his death by Princess Elena and her children Prince Iliaş and Stefan and Constantin in 7058 (1550), on September 4“. On the north façade, only the medallions with angels just under the roof have survived. The deep eaves have protected these paintings from changes of temperature, rain, snow and direct sunlight. A barrel-vaulted entrance leads through the gate tower into the monastic compound. On the western façade of the gate tower is another small niche, this time with a painting of the Virgin Mary and the Child. The monastic compound measures ca. 90 m x 90 m. The Church of St. Nicholas stands nearly in the middle of it with its main apse towards the gate tower. The church is an archetype of the Moldavian style with its long and narrow shape, 36.20 m long and 9.50 m wide, and its three apses. At the east end of the church, above the naos, sits the graceful lantern tower, reaching up to a total height of 30 metres. 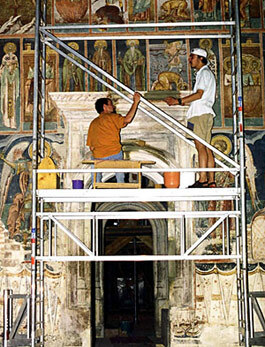 The church had been partly restored and repaired several times in the past, but between 1996 and 2001 UNESCO, the Japanese Trust Fund, and the Romanian Ministry of Culture, collaborated in completely restoring the church and most of the monastic compound. The main aim of the project was to clean and restore all the exterior and interior frescoes to their original beauty, but in conjunction with these, various architectural and archaeological works were carried out. During the recent UNESCO restoration campaign, the overpainting was removed to reveal the original layer. 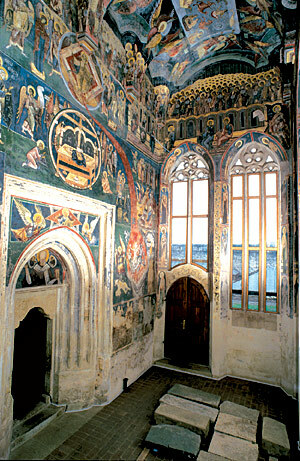 On the left can be seen the 19th century overpainting, and on the right the 16th century frescoes. Salts and humidity rising from the ground were the main causes of damage to the paintings. To prevent further salt deterioration, the stone bench, which runs all around the church, was dismounted, old cement mortar was removed, and the bench was reassembled without using cement. The problem of rising damp was solved by constructing a wide pavement and a drainage system, and channelling rainwater falling from the eaves into the drains. Humidity and lichens had damaged the buttresses that support the church walls and corners, and several blocks of stone were replaced. The stone window and door openings had also suffered from weathering, and the most deteriorated pieces had to be replaced. The less damaged stone frames were repaired after the removal of lichens. The many broken windows and rusted iron window frames had caused rainwater to seep in, with consequent damage to the interior mural paintings. The new double windows are mounted in wooden frames to prevent condensation. The stone frames date mostly from a restoration of the 1930s and only five windows have original carved pieces in the upper part. Across the one surviving threshold is the pronaos with its twin domes and large windows. 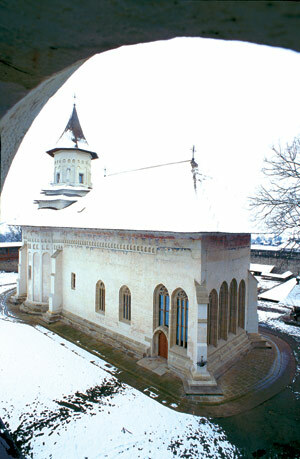 Although double domes were used before Probota in the monasteries of Neamt (1497) and St. John the New (1514-1522), and after Probota in the church of the Bishopric of Roman (1542), and in Sucevita Monastery (1584), only in Probota were the complicated Moldavian vaults used to this extent. The complicated system of arches, apses and pendentives compose the space of the naos. Above, in the middle, is the tower and behind the beam is the half-dome of the chancel. The iconostasis divides the naos from the chancel. 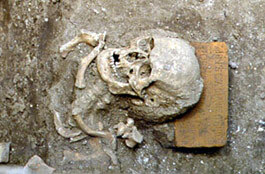 The tombs found are marked with glass rods placed in between the bricks, and the tombstones are laid against the walls. Under the floor a new heating system is embedded to maintain a stable temperature and relative humidity inside the church. The door in the north wall is new, a replica of the previous one. The two other doors were cleaned and repaired, and several deteriorated blocks of stone from the doorframes and steps were replaced. The eight exonarthex windows and the four pronaos windows were walled up at the end of the 18th century. The entrance to the church goes through the exonarthex. The main entrance to the church is through the southern door of the exonarthex. The floor here, as in all other parts of the church, is new, paved with bricks that were made on the model of the original floor found in archaeological excavations. Eight Gothic windows cover three of the walls from corner to corner and fill the exonarthex with light. On the stone jambs of the windows, there are the 64 figures of The Holy Martyrs and Pious Women. Above them on the west wall, against a background of intricate floral decoration, there are round medallions with The Bishops. The lunettes highest up show The Prophets and Kings of the Old Testament holding long scrolls of prayers. 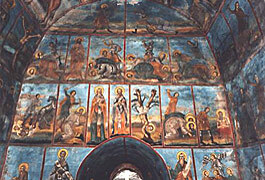 All other surfaces of the exonarthex are covered with a new theme in Moldavian mural painting: The Last Judgment. This composition covers the vault, the upper part of the north and south walls and the whole east wall. 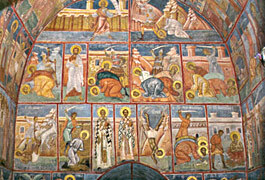 The Last Judgment is composed on a vertical axis on the eastern wall. 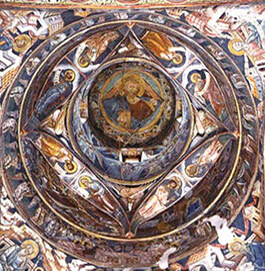 God the Father, in the middle of the vault, is followed by the images of the Son and of the Holy Spirit, forming the Trinity present at the Last Judgment. The Son the Judge, sitting on a throne, is in the middle of the east wall inside a multicol-oured square set in a circle. 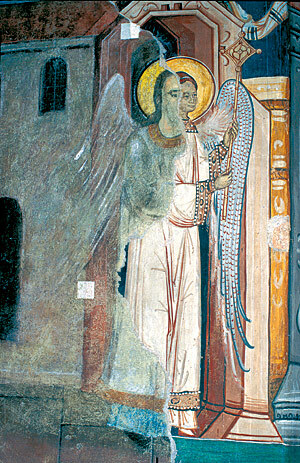 To the left is the Virgin Mary and to the right St. John the Baptist, in the classic composition of Deisis. Below Jesus is The Throne of Hetoimasia, or of the Second Coming, inside a multicoloured glory. Probota is situated 27 km southeast of Falticeni. In Falticeni you can find accommodations and travel information. Falticeni is 26 km by car from Suceava on European road E85. 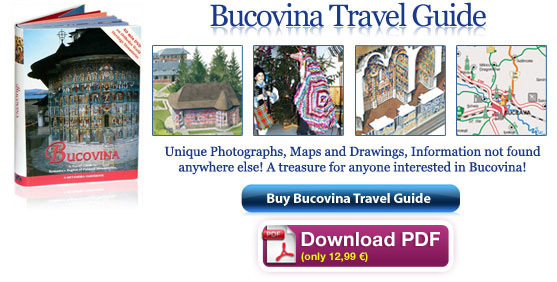 Suceava can be reached on the main European roads E85, E58, but also on the railway Bucharest-Chernivtsi-Lvov or by air. The city has an airport with flights to Bucharest and even abroad. 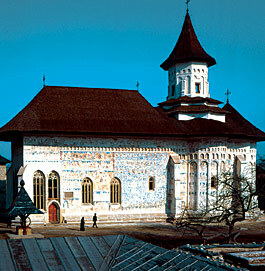 The south façade of the church of Probota Monastery during the UNESCO restoration campaign 1997-2000. Christ Pantocrator blesses the congregation from the tower dome. The façade had been covered with limewash for nearly two centuries before the first partial cleaning operations in the 20th century. 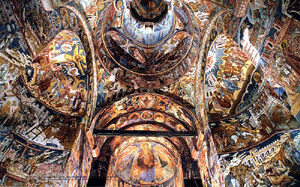 The frescoes are among the oldest, and not yet perfected methods of fixing the pigments may explain why here in Probota the colours are very faded and detached. 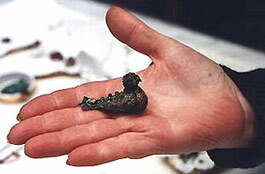 A hat brooch discovered in a grave in the pronaos. A skull with a brick pillow. Well, I am a very young architect from Ethiopia who really loves conservation and restoration of historical buildings. I am really impressed very much, it was a very outstanding work.